The Google Ajax Search Suggestions you get when you do a search on Google.com give you even more. Now they have Web Definitions. 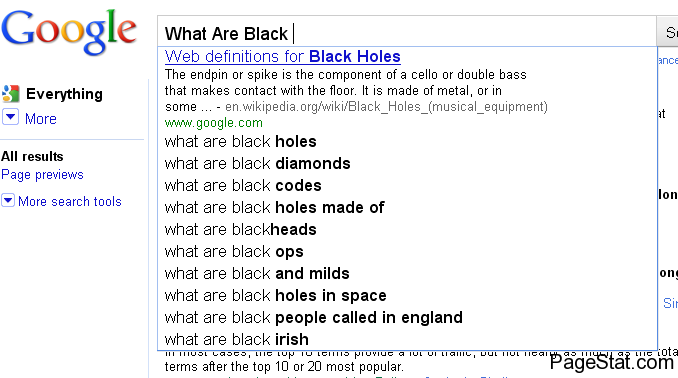 In addition to the suggestible popular search terms if you type in say “What are Black” it then populates the first box not with “What Are Black Holes”, but with a definition from a database. This is good for the search giants internet users but bad for many webmasters. 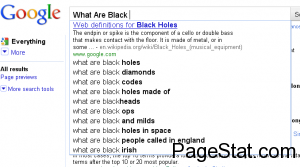 If Google users can get the answer without having to visit your page Google may steal/retain a ton of traffic and therefore revenue from those sites that specialize in question answer subjects like about.com and similar. So another question is how long will it take Yahoo, and Bing to implement similar technology? Will Google keep this up? Tell us what you think about this new feature, do you like it, love it, or hate it.. and why?